Harvard researchers wanted to improve on their 2014 flow battery. Their goal was to replace the conventional bromine-bearing electrolyte with something nontoxic. 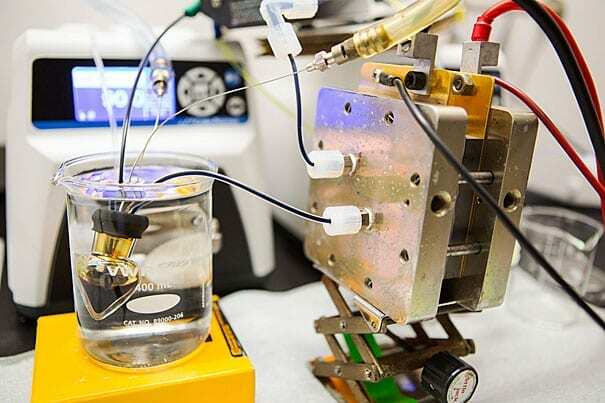 In a paper released today, the team’s findings “deliver the first high-performance, nonflammable, nontoxic, noncorrosive, and low-cost chemicals for flow batteries.” A prototype of the battery is pictured. A team of Harvard scientists and engineers has demonstrated a rechargeable battery that could make storing electricity from intermittently available energy sources, like sun and wind, safe and cost-effective for both residential and commercial use. The new research builds on earlier work by members of the same team that could enable cheaper and more reliable electricity storage at the grid level. April 17, 2019 - Plattsburgh welcomes Novacab, a Canadian alternative energy company MyChamplainValley.com FOX44 & ABC22Novacab, a Canadian based green energy company has expanded its manufacturing facility to Plattsburgh their first in the United States. March 25, 2019 - PG&E wildfire-linked bankruptcy imperils big Bay Area green energy project The Mercury NewsPG&E's bankruptcy could torpedo an energy storage project in south San Jose, a potential failure that might shove the fate of a big natural gas plant into limbo. April 9, 2019 - There Are More Than 500000 Potential Wind and Solar Energy Storage Spaces on Earth, Study Finds Green MattersA team of researchers reported that the planet has more than enough space to store wind-generated and solar-generated energy reserves.